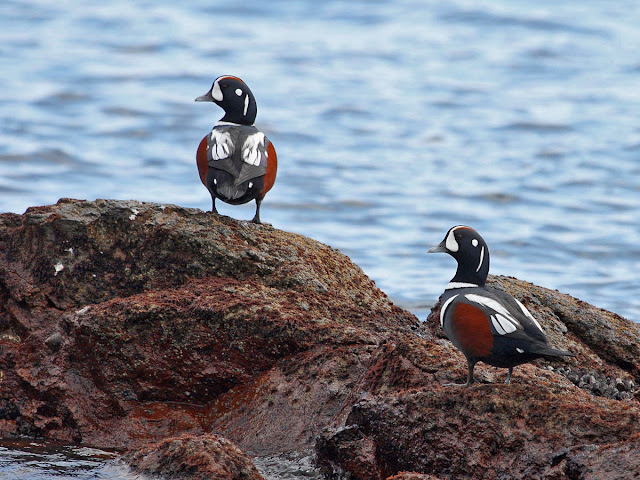 Some Harlequin Ducks near Menagawa this afternoon. They say bad luck comes in threes and so it proved this last week. Firstly I got a nasty sore throat (which kicked in about 5 days ago and still lingers), secondly my wife had been expecting to start a new nursing job in a small clinic this month and had quit her former part-time one only to be let down at the last minute by some a**hole of a doctor who reneged on his promise and thirdly Liverpool lost their unbeaten record and lost top spot to Chelsea (what odds on Chelsea staying top to the end of the season?). 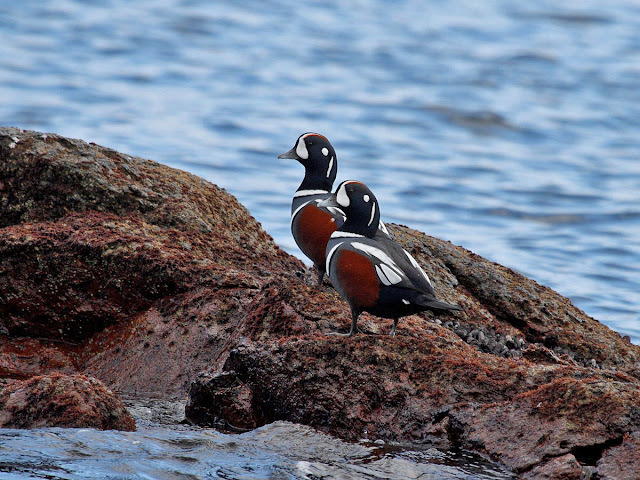 Last year at the same time I got some nice shots of Harlequin Ducks even with a crappy $100 Sigma lens. This time the ducks didn't allow such a close approach, apart from this obviously sick individual. Something about the contrast and light/dark areas really confuse my camera (or confuse me, a bad workman etc). I ran all these shots today through the shadows/highlights in photoshop. Hmmmm..........slightly better. Whilst I was waiting around for the Harlequins to swim closer there were several Blue Rock Thrush around. Not dissimilar in colours to the ducks, with similar dodgy results. There were also lots of Gulls and Cormorants around. 2 species pf Cormorant, the Japanese and the Pelagic (the smaller glossier looking one). Not so many interesting Gulls yet and no Brent Goose in the harbours either. Birds of the day were the 2 Stellers Sea Eagle high in the sky just east of Hakodate. Lots of raptors around actually. Sparrowhawk, Peregrine and Buzzard as well as the common Black Kites. So in addition to my Lulu calendar I've also finally finished my blurb photobook at last and can concentrate on doing my new website. It's coming on in fits and starts. Slowly. I've just deleted some pages actually. Now I have to, er, do some more I suppose. Tomorrow I think. Are you avin a laugh? A crappy week maybe when folk let you and the family down, but don't worry about the football - it's only second best to cricket. Anyway seeing all those harlequins definitely isn't crappy.